Kubota skid steer loaders can handle tough construction work and precision landscaping jobs. As the only Elite Kubota dealership in South Carolina, count on Steen Enterprises to offer expert advice on Kubota Skid Steer Loaders. Whether you need a skid steer to keep up with the Lowcountry construction boom, for helping put the finishing touches on a residential landscape project or digging out a foundation for a small pool, you can count Kubota quality day in and day out. The Kubota SSV Series skid steer is known for its power, toughness and maneuverability. Ideal for digging and lifting in places a bigger wheeled loader wouldn’t do. To add to the versatility, there’s a large assortment of attachments available for the SSV Series skid steer, including grapples, hammers, rotary cutters, graders, tillers, tree pullers and more. If you want a more economical solution to do more than digging and lifting, a skid steer just might be the right tool for you. Kubota compact skid steers come standard with a two-speed transmission so you can go from 7 MPH to over 11 MPH with the flick of a switch. The reliable Kubota diesel engine is built to run strong and hard day after day. With a door mounted fuel tank, Kubota has opened up the engine compartment, making it easy to access for regular maintenance. Borrowed from Kubota’s Compact Track Loaders, the loader arm on the SSV Series can push and dig as good as a radial machine and is reinforced in all the right areas. The cab on Kubota Skid Steers is 36 inches wide and allows operators to comfortably pivot when looking to their rear. A two position suspension seat makes long days easier on the operator. Ergonomic hydraulic pilot controls make operating this machine easy and there’s no delay when using them, which is essential in tight spaces and when doing delicate work. 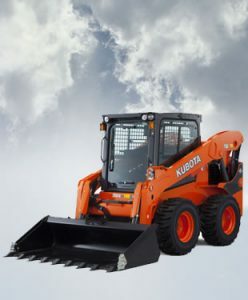 Our Kubota experts are here to answer any questions related to Kubota skid steers or other Kubota construction equipment.